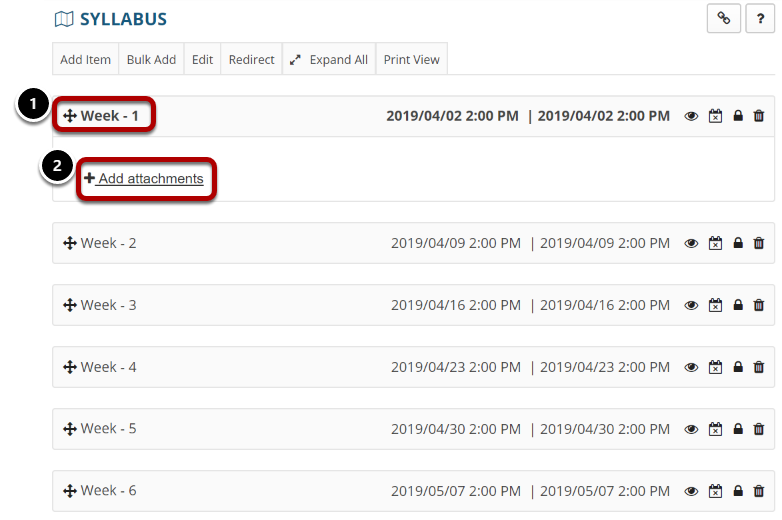 Sakai Community DocumentationSakai 19 User Guide (English) SyllabusHow do I create a multi-part syllabus by dates? You can create a multi-part syllabus using a date and calendar format, outlined here, or based on the number of items needed. (See How do I create a multi-part syllabus based on the number of items needed?for more information.) The date and calendar format creates a specific syllabus item for each meeting time of the class. 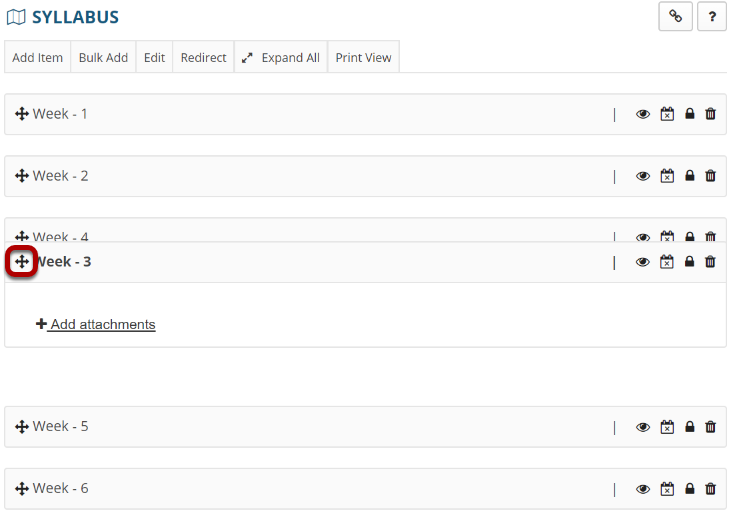 Select the Syllabus tool from the Tool Menu of your site. Enter a title. Each syllabus item will contain the title you specify with a number appended. Select the radio button next to the Create syllabus items by dates option. Enter the start date of the semester using the date-picker calendar icon. Enter the end date of the semester using the date-picker calendar icon. Enter the start time of the class. (Optional) Enter the end time of the class. Check the appropriate boxes to select which days of the week this course will meet. You will then be taken to a screen where you see the number of syllabus items requested. Note: It is not possible to add or edit in-line text content from the item listing. 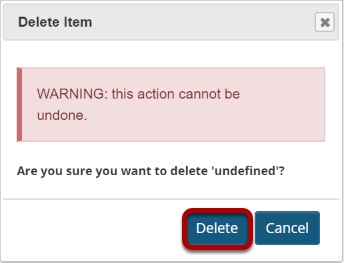 You must go to Bulk Edit in order to add or edit in-line text. Click on the title of the item to expand that item. Click the Add attachments link. Browse for the file on your computer, or attach a copy from the Resources in your course, then click Continue. Your file attachment will display. Click the crosshair icon to the left of the syllabus item heading and drag it to the desired location. 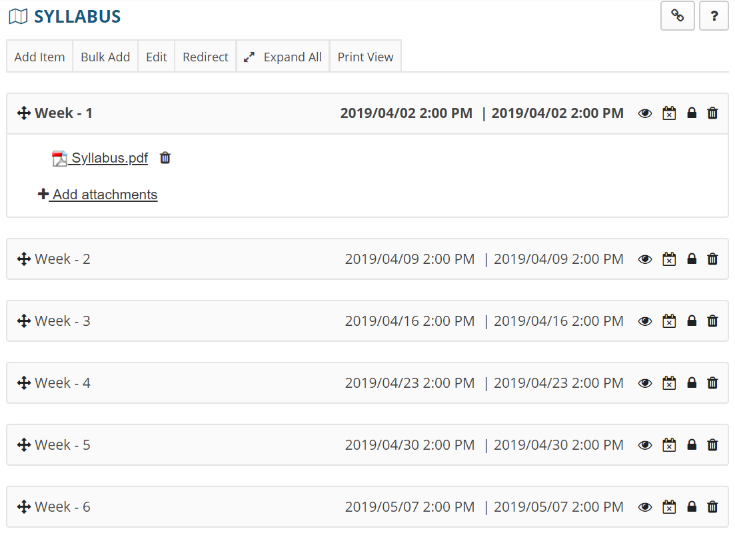 Click the eye icon next to the syllabus item to publish or unpublish the item. If the eye icon is open, the item is visible to students. If it is crossed out, it is hidden from students. In the above example, Week 1 is available to students, and Week 2 is hidden from students. Add a Syllabus item to site Calendar. 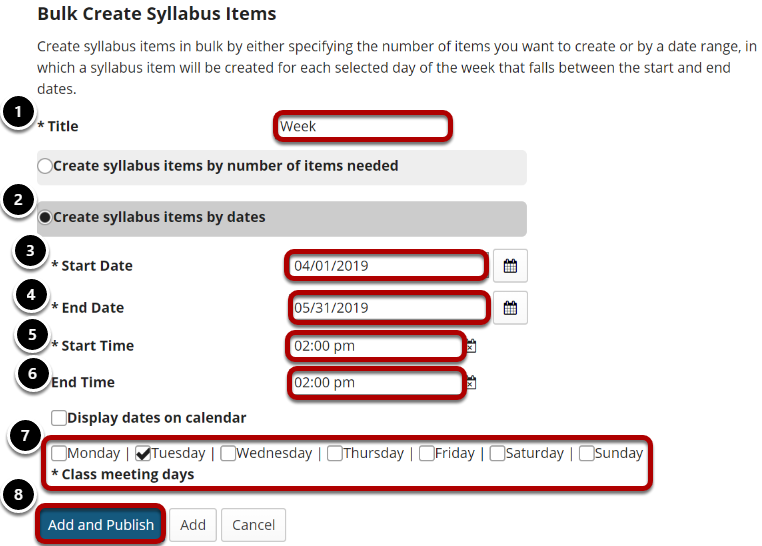 Click the calendar icon next to the syllabus item to display the item in the site calendar. A calendar icon with a check mark indicates that the item is included in the Calendar. A calendar icon with an X indicates that the item is not included in the Calendar. In the above example, Week 1 is included in the Calendar, and Week 2 is not. Note: You must specify a start and/or end time for the item before you can add it to the calendar. For more information on how to specify start/end times, see How do I edit syllabus items? 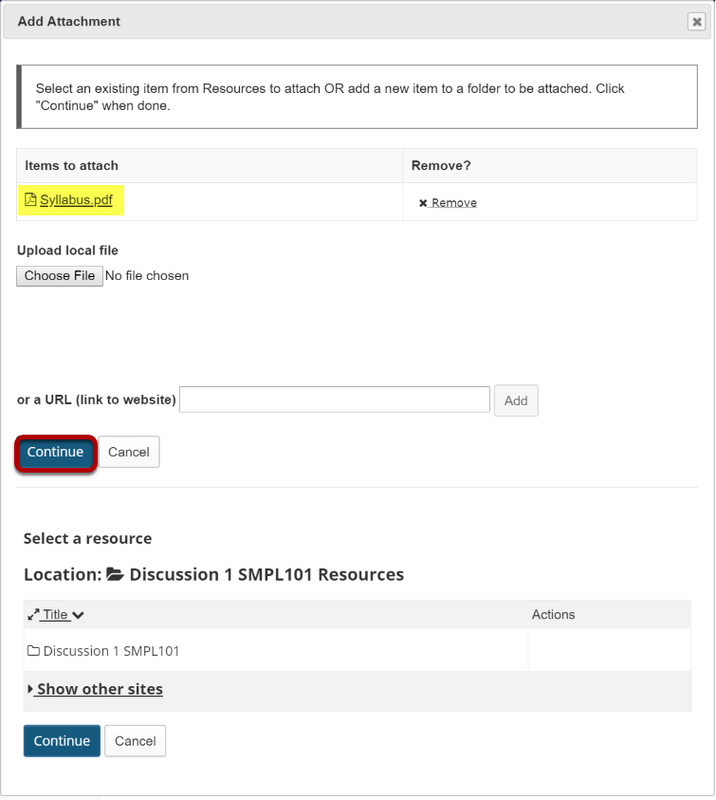 Click the lock/globe icon to change the access for a syllabus item. A lock icon indicates the item is available to only this site. A globe icon indicates the item is publicly available to the whole world. In the above example, Week 1 is available to site participants only, and Week 2 is available to the public. Click the trash icon beside any syllabus item to delete it. Prev: How do I create a multi-part syllabus based on number of items needed? Next: How do I print the syllabus?